Love these barstools. They look great and are very comfortable. So far they are holding up great but they are just a few months old. 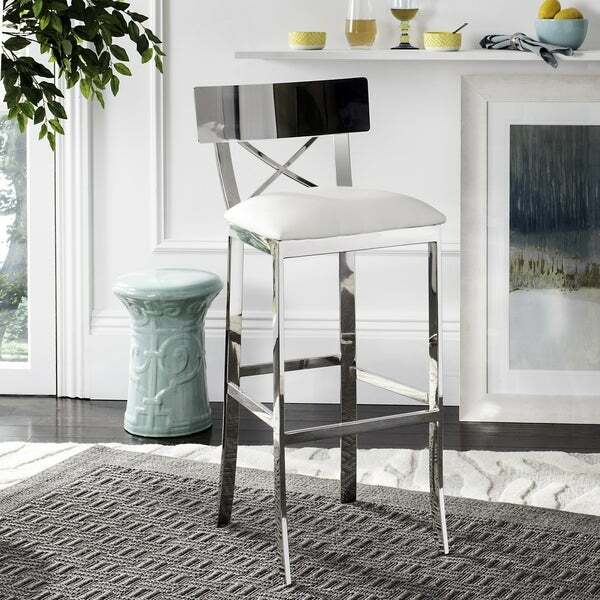 This modern barstool is at the height of fashion. Inspired by Londons legendary art deco bar, its polished stainless steel finish is as smooth as Bonds martini. With cross back detail and smooth white leather-style upholstery its always in good taste. Dimensions 17.5" x 18.8" x 39"
Very comfortable, sturdy, heavy.. I received several compliments so far. White leather seats feels like cloth. Worth the price..
"What is the height of the entire bar stool?" Dimensions	17.5" x 18.8" x 39"
"What is the height of the seat?" The seat height is approximately 30.5 inches.